ABSOLUT "WIN 1 OF 40 SKULLCANDY HEADPHONES"
Buy a bottle of Absolut Vodka in-store, find the unique code on the back of the neck tag or inside the limited edition pack, and enter it HERE for a chance of winning Skullcandy headphones and other weekly prizes. 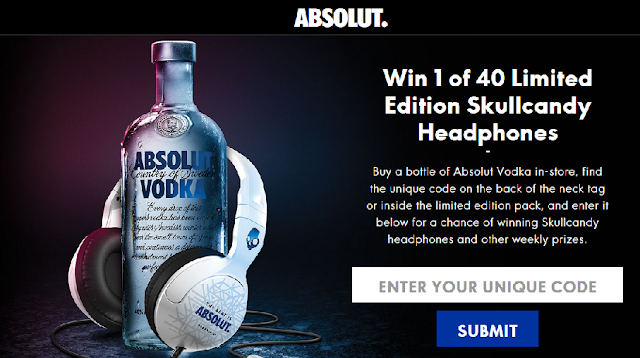 Follow Absolut on Social Media FACEBOOK, TWITTER, INSTAGRAM & YOUTUBE and WIN. Connect with Absolut on social media and stand a chance to win instant prizes.